After lamenting to Jamie (more like whining—until Jamie told me to man up) about how common a misunderstanding it is among small to medium-sized business owners about the fact that while a simple logo does become an identity by default, it is much different to have a logo deliberately designed to be applied into an identity system than to just have a logo that has been designed in a white box that you then take to a printer, web developer or sign fabricator and allow them to interpret how it is applied based upon their whims (and questionable design abilities). After arriving at an epiphany we hit upon the idea that documenting this process would be a helpful exercise to help other small business owners understand some of the issues involved with facing the maturing of their business and its growth, but recognizing that its now time to put some “big boy (or girl) pants (pant suit)” on, as it were, and take the opportunity to invest in their identity to help elevate their brand position in order to attain their business’ ultimate goals. In the coming weeks, Jamie and I will be highlighting the process of going through a complete identity design overhaul for JEB Commerce. I will be posting the progress and will for the first time, grant access to what is normally only a client accessible area to the general public in order to view the comps online and even provide feedback in the process. However, we will reserve the right to ignore said feedback if we disagree. 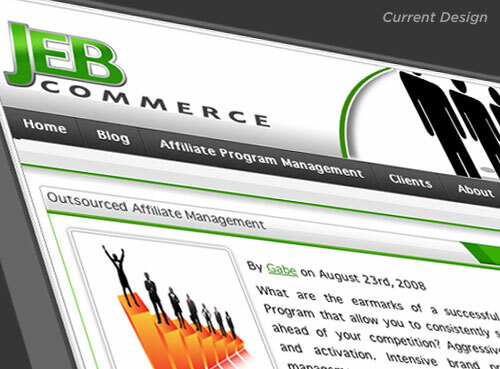 Jamie, for his part in the process, will also be posting to the JEB Commerce blog with his thoughts and updates of the process along the way in order to help educate the multitudes of Affiliates that work with and follow JEB Commerce. So, stay tuned for what I hope will be an educational process that just might open your eyes to the value of investing in a true identity system that has been thought-through and designed to communicate the essence of your brand and then can be applied to all your points of contact with your customers thereby elevating your brand to the level of respect and authority you have earned over the years, but are being held back by an immature identity.